This animal theme puzzle by eeBoo comes with 20 thick cardboard puzzle pieces to assemble the entire alphabet. Meet the animal friends from this eeBoo’s latest edition to the 20 Piece Puzzle line. 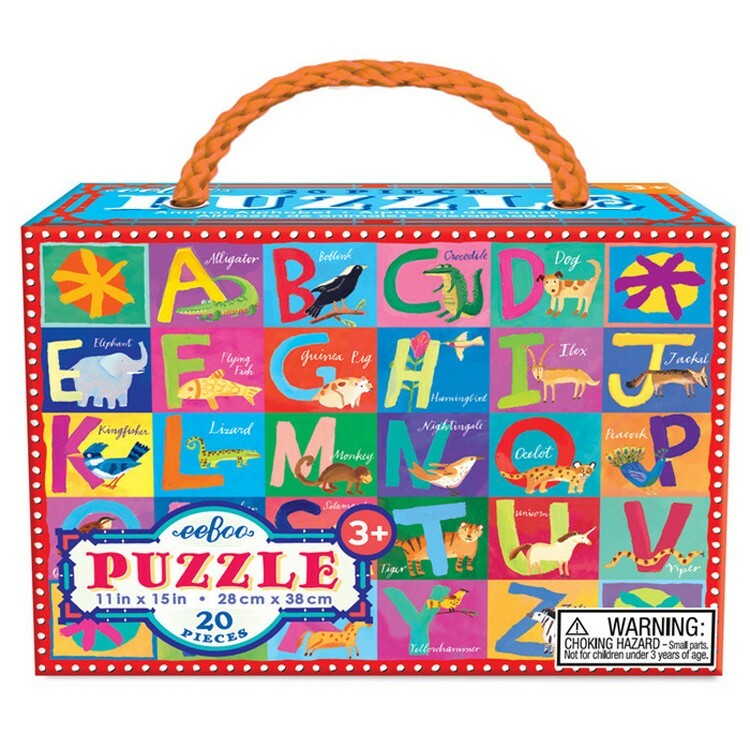 Animal Alphabet 20 pc Puzzle features artistic illustrations of the popular and exotic animals, thick cardboard jigsaw pieces, bright colors and compact storage bag with carrying handle. This letter learning puzzle will expand you child's vocabulary and inspire kids to learn more about nature. The colorful illustrations on the Animal Alphabet 20 pc Puzzle are provided by acclaimed children’s book artist, Melissa Sweet. Printed on durable cardstock composed of 90% recycled greyboard, this alphabet learning puzzle from Educational Toys Planet measures 11 x 15 when complete. Dimensions of package 4.02" x 5.39" x 2.28"
Write your own review of Animal Alphabet 20 pc Puzzle.